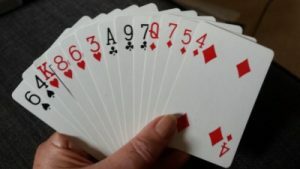 A few days ago someone asked me if I had any hints or tips for looking after their playing cards between bridge sessions. I did a little research and came up with one technique that I’d not come across before – Fanning Powder. You can read more about that further down. You want to look after your cards properly so you can enjoy using them but give them the maximum life possible before having to replace them. My top tips for looking after your playing cards. The first might seem obvious – always wash your hands before handling your cards. Sticky fingers make sticky cards, which makes shuffling, dealing and handling the cards difficult. Whether or not you want to go as far as asking your guests to wash their hands first is up to you, but maybe use serviettes or a packet of wet wipes if you serve tea and buns during your break. Next, take care when returning your cards to their storage box. Tap the stack gently to ensure that all the cards are in a neat bloc, with none poking out. This will help avoid damage to the edges and corners. Damage that will making using your cards more difficult. Store your cards in a dry place. Damp cards will quickly warp and become sticky and unplayable – I know, I once lived in a very damp, ground floor flat. Keep your cards away from condensation on damp windowsills and make sure you store them in a dry cupboard or drawer. If someone with sticky fingers does handle your cards, most can be cleaned with a slightly damp cloth. Sticky cards accidentally added to the pack will pass their stickiness onto the card(s) next to them – and on to others if shuffled whilst sticky. A quick check of the cards at the end of the game will tell if you any need a quick wipe. Next the technique I hadn’t heard of until I researched this article. Fanning powder. I think it’s meant for magicians, and ensures their cards fan smoothly and easily. But if it works for magicians, it should work for bridge players. It isn’t expensive and you can purchase it online via major shopping websites. I read somewhere that talcum powder might also work. I have to confess that I haven’t tried it. You only need to use a small amount it seems and it might be worth a try, especially if (like me) you have talcum powder in the bathroom for daily use. My cards might soon smell of baby powder. Finally, take care when handling your cards even if they are in their storage boxes. Sounds obvious, but make sure they are stored flat and not thrown into a cupboard at an angle between other, heavier objects which will put pressure on them and bend or distort them.